U.S.-Mexico Border Crisis: LaRouche Had It Licked in 1982! 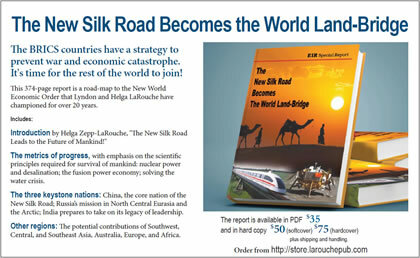 LaRouche Had It Licked in 1982! A PDF version of this article appears in the February 3, 2017 issue of Executive Intelligence Review and is re-published here with permission. January 31, 2017 —Lyndon LaRouche burst onto the political scene in Mexico, so to speak, with a Nov. 1, 1976 prime-time address on U.S. national television on the eve of the presidential elections, in which he warned that the financier circles sponsoring Jimmy Carter’s presidency were committed to plans which would lead to thermonuclear war with the Soviet Union, and death for the Third World. LaRouche cited their policies towards Mexico as exemplary of the “genocide” which these circles intended to bring about. When President José López Portillo took office in December 1976, LaRouche found a ready Mexican partner for his proposals for reshaping U.S.-Mexican relations on a Hamiltonian basis. López Portillo was wide-open to such Mexican-U.S. collaboration, and a mutual friendship developed between these two fierce patriots of their respective nations, forged in their history-shaping, six-year battle to overcome the British monetarist global order oppressing both nations. In López Portillo’s first year in office in 1977, his government announced that Mexico had discovered huge new oil fields, and it would use that oil to carry out a 20-year crash economic development program, which would modernize Mexico’s agro-industrial productive base and move it into a nuclear-powered economy. Former Mexican President López Portillo (left) endorsed the wisdom of Lyndon LaRouche at a joint forum with Helga Zepp-LaRouche on Dec. 1, 1998 in Mexico City, Mexico. LaRouche responded by putting forward a strategy for the United States and Mexico to negotiate an oil-for-technology agreement under which Mexico could exchange its oil, at fair prices, for the purchase of U.S.-made machine tools, capital goods, and equipment to modernize Mexico’s agriculture. The United States could expect to export some $100 of the estimated $150 billion in such goods which Mexico would need to import over the coming decade, creating one million new high-skilled jobs inside the United States in the process, EIR calculated. Nuclear plants completed or planned as of 1980. LaRouche’s audacious “oil for technology” proposal sparked excitement in sane layers on both side of the border. The Carter Administration was determined that such a threat to the British world-imperial order system would never be tolerated. In the infamous phrase of National Security Advisor Zbigniew Brzezinski, the United States could not accept “another Japan south of the border.” Threats and economic warfare were not succeeding. Plans were drawn up for a finance-run “North American community” through which to grab control of Mexico’s oil resources, so that no Mexican government could ever use them for development. Out of this grew the destructive NAFTA accord finally imposed against the United States, Mexico, and Canada in 1994. President Ronald Reagan was a whole different kettle of fish, and his team was very familiar with LaRouche’s U.S.-Mexico proposal. When he took office in 1981, the potential to overthrow the whole system—as LaRouche was proposing—rose to a major strategic threat to the British system. Before even being sworn in, President-elect Reagan met for three and a half hours with López Portillo; EIR’s sources on both sides of the border reported that the meeting was cordial and both leaders were pleased. LaRouche visited Mexico again in 1981, this time speaking in Monterrey and Mexico City. EIR escalated its organizing, holding well-attended seminars in Washington, D.C. and Mexico City elaborating LaRouche’s proposal, in which Mexican officials participated. 1982 EIR proposal for industrial projects in Mexico, which overlapped projects proposed by President López Portillo. By 1982, the global financial system had reached a breakpoint, ruined, as LaRouche had warned it would be, by then-Federal Reserve chairman Paul Volcker’s usurious measures. In April 1982, Great Britain launched its colonial war against Argentina, sending NATO warships steaming into the South Atlantic on the pretext of reconquering the Malvinas Islands. LaRouche immediately called for the United States to adhere to its Monroe Doctrine commitment to defend the other countries of the Americas against any oligarchic threat to their independence. LaRouche was respected as the only American leader who denounced that war for what it was, NATO’s first “out-of-area” deployment to conduct “population and raw-materials wars” against developing-nation debtors in the continents of Ibero-America, Africa, and Asia. His fame soared throughout Mexico, and Central and South America. With Ibero-America rallying around Argentina’s cause, LaRouche was invited back to Mexico, this time to meet personally with President López Portillo. On May 27, 1982, in the midst of the Malvinas War, Lyndon LaRouche emerged from his 40-minute meeting with López Portillo to answer questions from 60 waiting journalists in the press room at the Mexican presidential residence, Los Pinos. The first question asked, was what LaRouche thought about “British colonialist aggression.” LaRouche denounced the war as a precedent for out-of-area NATO deployments to defend a dying financial system. He said that he and President López Portillo were on the same side, that of peace and stability, Excélsior reported, and that their alliance “should also embrace India, the countries of Europe, and the Non-Aligned, since only a bloc of forces of that size could succeed” against that system. At a conference in Mexico City earlier in the week, LaRouche had proposed that the Ibero-American debtors jointly drop the “debt bomb” against London as the only means available to defeat the British NATO assault on Argentina. In his press conference at Los Pinos, he also developed the need to create “an Ibero-American Common Market which would give the countries belonging to it the possibility of defending themselves in the conflicts stemming from the international economic crisis,” as Excelsior reported. Lacking the courage to adopt LaRouche’s strategy, Argentina capitulated to the British in early June. The war against the Mexican peso and other Ibero-American debtors escalated, exactly as LaRouche had warned it would. In Operation Juarez, LaRouche warned the United States and Ibero-America that a general, chain-reaction collapse of financial institutions was rapidly approaching. There is nothing to gain from begging from this system; if Ibero-American nations wish to survive, they must take collective action, he proposed, and impose a debt moratorium to force the great powers agreed to negotiate a new, production-based system. The policy document offered a war manual for defeating the British monetarist system, elaborating for its readers the principles of physical economics, as they are rooted in human creative mental life. Those principles are valid to this day. On Sept. 1, 1982, López Portillo took steps to put LaRouche’s Operation Juarez program into action, risking his life to defend Mexico from international financial speculation. In a dramatic speech to the nation, he denounced the “financial plague [which] plunders country after country” just as the rats spread the plague in the medieval era, and detailed how the country’s physical economy and the population’s well-being had been looted by the private banks channeling more than $54 billion to foreign financiers through capital flight. “We must organize to save our productive capacity and provide it with the financial resources to move forward,” he told the nation, and then announced that as of that moment, the Wall Street-controlled Central Bank and private banking system were nationalized, and general exchange controls imposed. From the United States, LaRouche vigorously supported López Portillo’s measures as an assertion of Hamiltonian national banking and credit-policies, and detailed the measures required for a comprehensive monetary reorganization of the international system as a whole. EIR was later informed by impeccable sources, that López Portillo had called the presidents of Argentina and Brazil, and proposed that their three nations, the largest debtors in Ibero-America, jointly declare a debt moratorium, in order to force the creation of a new system, as LaRouche had recommended. Both refused, arguing in favor of staying in the system. That October, López Portillo argued the cause of humanity’s right to development in a speech before the United Nations General Assembly. “The reduction of available credit for developing countries has serious implications, not only for the countries themselves, but also for production and employment in the industrial countries.” Should action to reform the system not be taken now, “it could be the beginning of a new medieval Dark Age, without the possibility of a Renaissance”; the very survival of our children, of future generations and of the human species is at stake, he warned. Because Reagan was still president, the United States did not take immediate action against Mexico. But as soon as López Portillo was out of office in December 1982, British system forces used Henry Kissinger as their instrument to crush Mexico. López Portillo, and his measures to protect the nation, were vilified as the cause of the brutal economic crisis which then hit Mexico and worldwide, exactly as Lyndon LaRouche had warned it would hit if his proposed Operation Juarez debt reorganization were not carried out. The Malthusian, free trade policies which López Portillo had fought were imposed on Mexico, and as LaRouche warned, Mexico has been destroyed. As EIR famously warned in its 1991 Special Report, Auschwitz Below the Border: Free Trade Pact Is George ‘Hitler’ Bush’s Mexican Holocaust, NAFTA never intended to build up jobs in Mexico, but rather to destroy the productive labor force on both sides of the border, to the benefit of speculative capital. As many U.S. law enforcement officials have warned over the years, the biggest “winners” from NAFTA’s free trade were the drug cartels. By 2002, seven out of ten Mexicans had been reduced to poverty. Hunger is prevalent, and there are pockets of outright famine, because Mexico bowed to the free trade demand that it destroy its own national production, by opening the door wide to “cheaper” food imports. By 2008 (and it has worsened since), Mexico was dependent on foreign food imports to meet some 35% its overall food needs. Mexico, the original home of corn, imported 25% of its corn in 2008—and the once-corn belt states of central Mexico are the states of greatest emigration to the United States. In discussing earlier today what U.S. policy must be, LaRouche reiterated that Mexico was destroyed by what was done to López Portillo after he left office. His policies, which were LaRouche’s policies, still stand. Despite incessant attack, to the day he died in February 2004, López Portillo never repented of his actions to defend the nation, nor of his listening to the counsel of Lyndon LaRouche. 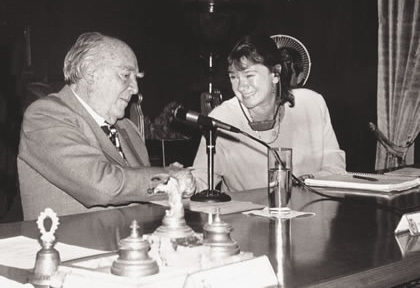 “It is now necessary for the world to listen to the wise words of Lyndon LaRouche,” López Portillo told the prestigious audience attending a joint forum with Helga Zepp-LaRouche at the Mexican Society of Geography and Statistics in Mexico City on Dec. 1, 1998. Only the transformation of the current world order into one which places the inalienable rights of people as individuals, and of nations, at the center of fundamental decisions, can initiate a new era of prosperity, peace and happiness. . . . In a battle for such an order, I would like to recognize the tireless and generous efforts carried out by Lyndon H. LaRouche, for whom I hope for the best as a pre-candidate for the Presidency of the United States. I wish that his voice be listened to and followed by those in the world who have the grave responsibility of stopping this situation from continuing on its calamitous course. . . .